When Gracie and Jake's Grandma passes away, these children come up with a brilliant plan to help them grieve and celebrate their grandmas life by hosting an Angel Birthday Party. They buy balloons, bake her favorite cake, and create their own memorable gifts to celebrate her special day. 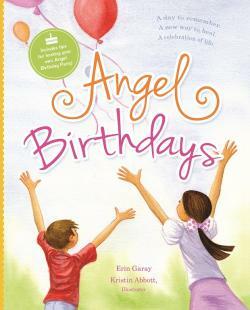 Angel Birthdays is a heartfelt book that encourages children and adults alike to reframe this universal experience. This story is positive, reassuring, and provides families with tangible activities they can incorporate into their own healing process. It is a true gift for any child, family, or friend who is celebrating an Angel Birthday of a loved one.